How to get there: The Lower Oneonta Falls is in Oneonta Gorge and is about 45 minutes outside of Portland by I-84 E. Take exit 35 to Historic Columbia River Highway. 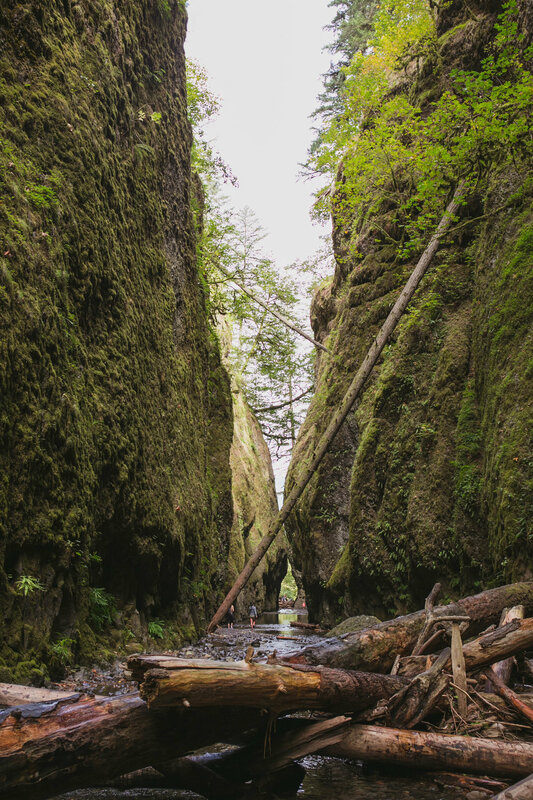 Oneonta Gorge is very crowded on the weekends so I’d recommend a weekday! There is limited parking on the left before and after the tunnel, so arrive early. We arrived around 9AM so luckily found parking easily. The ‘trailhead’ is down the stairs near the tunnel and bridge. You walk a short ways in before hitting the ‘Log Jam’ that requires some balance and caution but is completely doable. There weren’t too many groups while we were there so it didn’t take too long. However, if you do get stuck behind a slow group, there is a ‘jam,’ hence the name. Some found this part scary, but we found it pretty easy, just take it at your own pace! Short waist-chest deep section. Photo by Waylan Khuu. After the logs, it is only about a 0.3 mi walk-in to reach the falls. Most of the walk is in ankle-calf deep water. The middle section is short but does reach chest level (I am 5’0″) or waste deep for most. Make sure to hold your pack over your head unless it is entirely waterproof. I would recommend going on a hot day because the water is freezing. We happened to go on a cooler day (mid-September) so it wasn’t pleasant but still manageable. What to wear: Wear dry-fit clothing that doesn’t soak up a ton of water, or a swimsuit. Some recommend water shoes, but we wore tennis shoes and were fine. Be careful of your footing, the rocks are “rocky” (haha) and loose and you may jam your toes a couple of times. Make sure to bring a change of clothes and towels because you will definitely be cold and wet. Overall an amazing experience that I recommend everyone try. While it has super minor “challenges,” me and my friends still found it relatively easy, and think it is doable for all levels including children. Check out my favorite waterfall we visited: Abiqua and Butte Creek Falls!